Liverpool coach Jurgen Klopp on Wednesday praised Manchester City ahead of the two teams' highly anticipated clash. File picture of Jurgen Klopp. 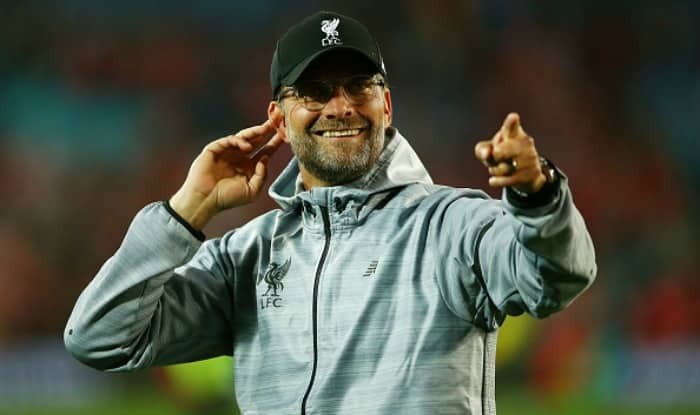 Liverpool coach Jurgen Klopp on Wednesday praised Manchester City ahead of the two teams’ highly anticipated clash that could prove decisive in the hunt for the English Premier League (EPL) title, as leader Liverpool leads third-placed Manchester City by seven points. During the press conference ahead of the game, Manchester City coach Pep Guardiola described Liverpool as the best in Europe, and Klopp responded during his own presser, reports Efe. “They are a really strong football team with an outstanding manager. We have to be prepared as well as possible,” Klopp said. Although Guardiola said they have yet to decide whether Kevin de Bruyne will take part in Thursday’s game, Klopp said that he hoped the Belgian midfielder would make it. “He is an outstanding player. Fernandinho, Kevin De Bruyne and David Silva are probably the three midfielders who played most of the time in the title-winning season – and missing a player like him is a massive blow. He played from time to time and was unbelievably influential immediately, he scored fantastic goals. He is just a world-class player. I expect it that he’s back,” he added.